Before you learn how to teach narration, you have to understand living books. The foundation of a Charlotte Mason education is exposing your children to many living books. Books for them to read individually and books that you read aloud to them. Books that you use to teach them history, science, character and more. Living books are special. They’re books that provide children with excitement and new ideas – often heroic ideas, which shape their minds and expand their spirits. As opposed to textbooks, we want to use living books. Books abounding with stories. Both children and adults have trouble remembering lists of facts; but stories are memorable. They incite the imagination and they immerse children in different cultures and times. They can strengthen values and build character. Stories can be life-changing. Charlotte Mason didn’t stop at just reading the stories, however. Ms. Mason believed that knowledge is not appropriated by the student until it is told back, or narrated. Beginning with short snatches of simple stories, teachers are to read a short paragraph once. Then have students tell back or “narrate” what they have heard. Teaching narration and practicing it regularly is the simplest way to discover what your children are learning. Ms. Mason believed that short narrations should start by age six, over lighter, but classic, short episodes of literature, including the Bible. Perfect literature for this purpose would be the short episodes of Aesop’s Fables (Stories for Young Children). Start with a paragraph at a time, and make sure to read through the selection consecutively. The next day, before starting the next narration/lesson, engage your student in a brief chat about yesterday’s lesson, affording your student a short period of review. Ms. Mason suggested a few anticipatory comments about today’s lesson as well. This was to encourage your child to be ready to eagerly listen to what be coming next. As students grow in age and practice, they may be able to begin to narrate a short chapter in a history or science book. This might be around age eight or nine. At that age, a few comments after the narration may be helpful to identify and emphasize the moral elements of the passage. If narration is a new activity in your home, it is important to allow for a learning curve. It is not necessary for your child to narrate every passage that she reads or is read to her. Often it’s best to read a chapter or two of a book before beginning narrations , to build interest and help your student’s immersion into the story. Also be sensitive to your children’s natural gifts. You might have a child that takes easily to narration and one that struggles. This is normal. It doesn’t mean the one who does it more easily is “smarter” or the other not as smart. For the one that struggles, provide more practice over easier passages, especially in the beginning! Do I Correct Faulty Information? What do I do when my child narrates incorrectly? This is a common question! A few strategies for dealing with this are below. Most importantly, it’s better not to interrupt a narration with corrections. Only after praising what was positive about a narration and after encouraging a child for his efforts, gently make necessary corrections. If you notice a repeated grammatical error, such as a double negative, incorrect subject-verb agreement, etc., make a note to cover that area later during a language arts lesson. If your student has many details to remember, such as difficult names, dates, or places, again, it may be helpful make a list of those things on a white board before the narration. Fortunately, there are other forms of narration other than oral ones as your kids get older and more experienced with narration. Although it is always best to begin with oral narrations for the younger children. But feel free to have a younger student draw a picture illustrating what was just read rather than do an oral narration. Another option, especially for the older student (10 or 11 on up) is to provide a written narration over what they have either had read to them or over what they have read independently. Sometimes the easiest way to start written narrations is to have students not worry too much about grammar and punctuation until they have written down everything they remember. Then during their next day’s writing lesson they can go back and clean things up a little. Written narrations over reading are excellent for middle and high school students, too! There’s a fantastic benefit to your upper grade children writing about what they read about in history, science, math and/or language arts! Students can narrate not only from books, they may also narrate over art work and music. As with all narration, this may be either oral, written or in picture form. Some ideas about picture study narration can be found here. Narration over music can be accomplished merely by playing a stirring piece of music and then asking your student to tell about what story they could imagine taking place in the music. Alternatively, they could also be asked to draw a picture over what they heard in the music. An added benefit of regular narration in those early years is that it helps order children’s minds and prepares them for formal composition lessons once they reach the appropriate age. The more exposure they have to hear, read and narrate excellent children’s literature, the more prepared they will be when it becomes time for them to write. 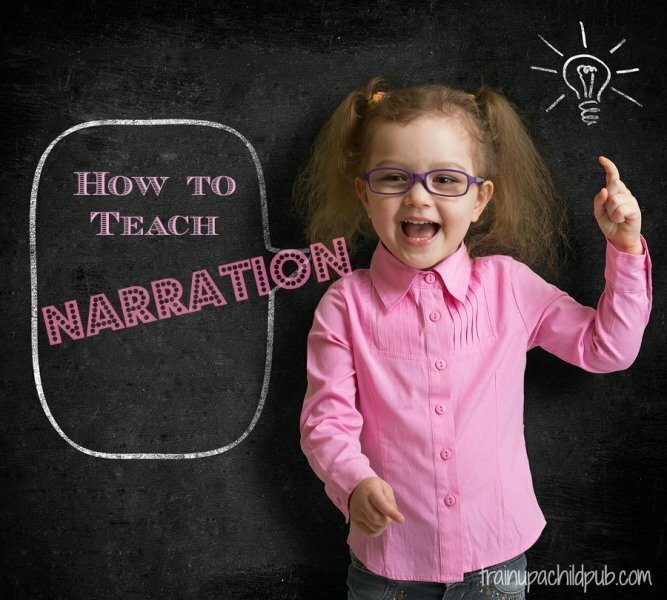 Narration is such a powerful teaching tool that I hope you’ll give it a try! It’s never too late to start! Just remember to begin slowly with short, simple passages. After a few months of regular practice you’ll be amazed at your students’ recall! If you’d like to start or you’ve been narrating a while, how’s it working for you? Tell me in the comments! http://www.epikardia.com is very informative. The article is very professionally written. Stopped by to say hi. Enjoy your evening. Very informative posts you have here on this blog. Well thank you, Christin! I’m glad we are helpful to you and appreciate your passing our site info on to others!